This problem is really proving to be a tricky one (and quite annoying). In SQL Server Management Studio 2008, up until a few days ago my IntelliSense was working great. Then all of a sudden it stopped. The icon as it as enabled on the toolbar menu, and under Tools -> Options -> Text Editor -> T-SQL -> IntelliSense it says it is enabled there. I have tried refeshing the IntelliSense cache with Ctrl-Shft-R but that doesn't work either. Any ideas what happened to my IntelliSense and what I need to do to get it back? There are cases where the local cache used by IntelliSense becomes stale. Refreshing the cache is easy but not necessarily obvious. Make sure "By default, open new queries in SQLCMD mode" is unchecked. I had this problem, so I followed Ritesh D's advice and went to Tools -> Options -> Text Editor -> Transact-SQL -> General. I checked IntelliSense, and found it was enabled already. However, I found that "Auto list members" and "Parameter information" were unchecked. So I checked them. This solved my problem. 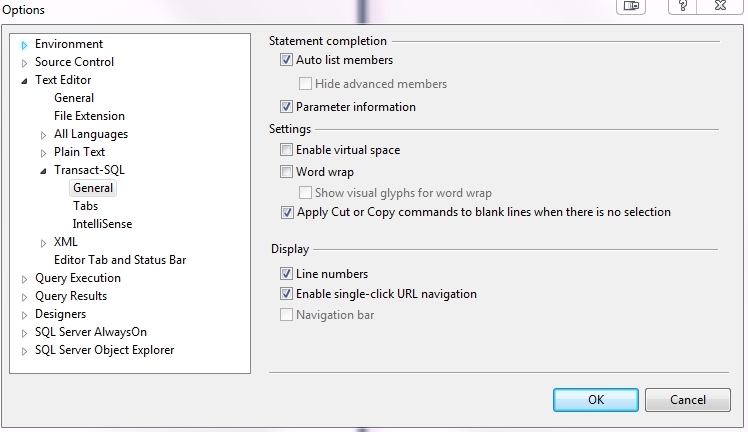 IntelliSense is the general term for a number of features: List Members, Parameter Info, Quick Info, and Complete Word. These features help you to learn more about the code you are using, keep track of the parameters you are typing, and add calls to properties and methods with only a few keystrokes. When you use remote database with low transfer connection (for example I connected from Europe to far Asia's office server) and when the database's structure is not small (for example many tables) then it takes much more time for SSMS to complete all IntelliSense data. OFFLINE databases can cause intelissense to stop working. You can test it by putting any database in your connected server to OFFLINE and reverting it. I had the same issue with SQL Server 2008 R2. It got resolved only after applying SQL server 2008R2 Service Pack 1. Not the answer you're looking for? Browse other questions tagged sql-server sql-server-2008 intellisense or ask your own question. Can SQL Server disable IntelliSense on SSMS? SSMS 2012 intellisense is not working on one of the servers?